Luxury camping in the New Forest or glamping is no longer possible. Why? 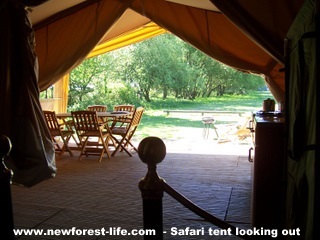 Luxury camping or glamping in the New Forest is no longer available - why? New Forest Safari Tent Glamping and Luxury camping has opened for the season at Sandy Balls New Forest Holiday Village for 2016. Find out what I saw when I recently visited. Please note this holiday village is not within a cattle grid - but there is one just a short distance along the road. Lots of people are trying to find out where to experience luxury camping or try out glamping in a bell tent or yurt in the New Forest. No campsite owns their own glamping tents or yurts therefore you'd have to make a pitch booking and then make a separate tent or yurt booking with a company. It takes time to set up and on campsites you are restricted e.g. must arrive after 1pm and leave by 12 a.m. on day of departure. 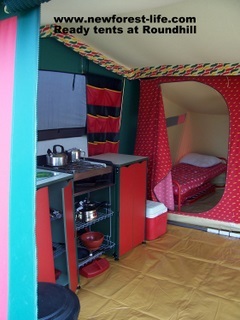 Pitch size needs to be at least twice the normal size when all glamping/yurts are set up which again causes problems. New Forest camping is based on a back to nature lifestyle tucking unobtrusively in with the natural surroundings and environment of the New Forest. I know you can say what about caravans? This is a good argument but although they may be perceived as unsightly when on site they can be moved fairly easily and will have caused little impact on the ground they pitched on. I think in one way it's a shame New Forest luxury camping, glamping or yurting is not possible as I know some wonderful companies who would provide some luxurious accommodation but also we have to protect the often unique environment of the New Forest too. Why is this type of camping in the New Forest no longer an option? Eurocamp provided the two luxury tent sites in the New Forest but pulled out of all their UK campsites 2 years ago and do not intend to provide this service again in the foreseeable future. Pre-Erected Tents were available at Sandy Balls Holiday Park, but are no longer an option for you. Now you can choose a Safari tent or Camping Pod but not a Ready tent. They didn't offer the luxury of safari tents and their only advantage is that they are put up for you. If you decide to opt for a luxury camping experience elsewhere in the country I've left my photos up for you to compare what may be on offer to you elsewhere. Apart from Eurocamp pulling out this year, I wanted to try to explain why the New Forest and luxury camping don't necessarily go together well. 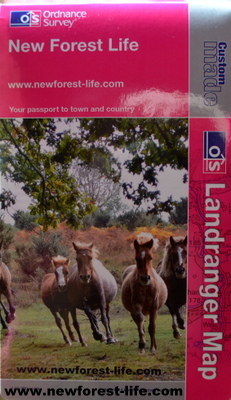 You'll need a good map to get around in all the hidden places of the New Forest. OS Explorer map 22 is the one to order! Now you can personalise it with your own picture. Find out where to go to discover pigs like these. I can tell you the best place to see pigs and other New Forest animals. So although de luxe or safari camping in the New Forest is not possible now, I hope you find somewhere just as good to stay in your own luxury hideaway somewhere in the UK or further away. If you use the handy Google Search tool to navigate around my website or explore further afield - good luck!